Café Rio, Costa Vida, and other similar restaurants let you buy sides of their meat. At Café Rio it costs $2 for a side of any meat. I always go with the sweet pork, but you could also buy the steak, chicken, or other meats (prices may vary for other meats and at other restaurants. I just know for 100% sure that the pork side is $2). You can also buy a plain tortilla for $1. So for about $3 you walk out of the store with a ton of meat and a big tortilla. If you don’t already have it, you’ll need to buy a cheap bag of cheese from your grocery store. I get a big bag from Walmart for like $3 and it lasts me about 6 quesadillas. So you’ll spend probably like $0.50 on cheese. Not a big deal. Seriously all you do is throw the tortilla on a pan, melt the cheese, and lay down the meat. One tip here: even though you’ll fold it in half, spread the cheese over the entire thing. It helps the sides stay together. 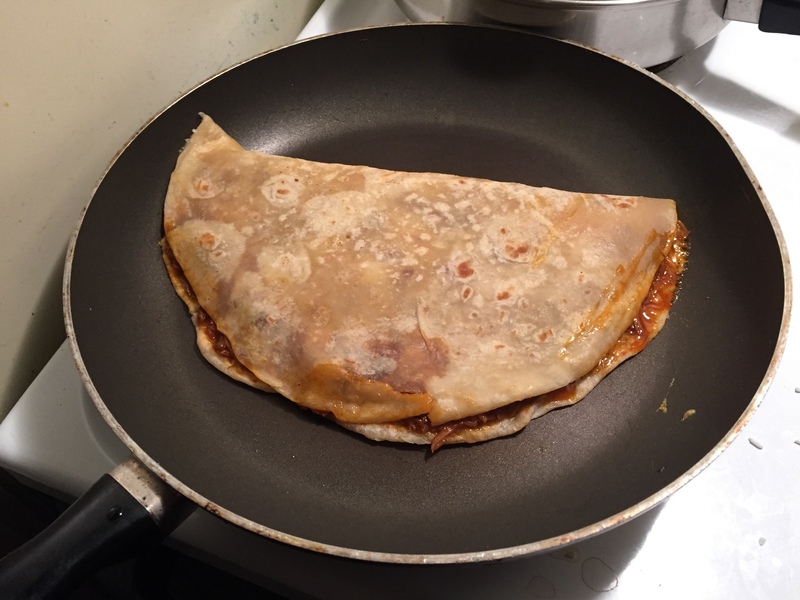 If you only do the cheese on one side of the tortilla, it’ll fall apart. Heat it up for a bit, then cut it into adorable triangles and enjoy! There you have it. A quesadilla with twice the normal amount of meat for a third the cost. Do you have any other life hacks to get delicious food for cheap? Leave it in the comments! ***I spoke to a friend who is a business sully-chain management major about this. For a while I was worried that if I shared this secret and everyone did it, Café Rio might not sell the sides separately anymore. He explained to me that either way, they are making a profit. They wouldn’t sell sides in the first place if they didn’t make money off of it. So go ahead! Hack away! Looks great! I love to cook. Have 5 to feed. Hugs! A must try because it looks delicious.. Thanks for the info.